My Mama was a special lady. She went through a lot of hardships in her young years and came through it stronger and more resilient. But my mama’s love for her family knew no bounds. She was kind, but if you were out of line she had no problem telling you so. Oh, and you didn’t have to be one of her kids for her to do it. She told several of my friends and my ex-husband when she felt they needed to straighten up and “fly right.” She did it in a loving way, not mean. Mama was feisty and never had a problem with speaking her mind, and if you didn’t like it, that was YOUR problem. On the other hand, if she thought you were truly sorry, she had the biggest heart in the world, would help you through any problem, and forgive you in a moment. She wasn’t cruel, just plain spoken but always compassionate. 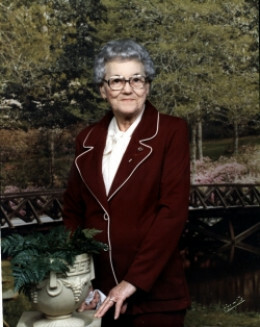 Mama, (given name of Esther, ) was the youngest of seven children, whose mother and father divorced when she was young. She lost her mother at the age of thirteen, which left her to be shuttled between the households of her married brothers and sisters. They did the best they could for her, but their focus, and rightfully so, was on their own families. Mama felt left out, alone and insecure. The only thing she could think of that would make her feel better, was to have a home and security of her own husband and family. She married my father when she was just a teen and he was 21 years old. She married him knowing nothing about loving a man. She just wanted a home of her own that she could feel wouldn’t be jerked out from under her. She had seven children with my biological father, but only four of us survived. I was the youngest. Marriage between my mother and biological father did not last and they divorced. In those days, a divorced woman was automatically assumed to be at fault. Because work for women outside the home was scarce, she began to do housecleaning, washing and ironing for those who were willing to pay. We never went to bed hungry, but we only had the basic essentials. There were times we noticed that Mama said she wasn’t hungry, and later we would see her eat what little remained after we’d finished. When we were grown we realized that she waited for us to get our fill, because she didn’t want to take away any nourishment from her growing children. When World War II began, times became a little easier for our family, because Mama went to work in a defense plant in a neighboring state. It brought in more money, but kept her away from us for up to two weeks at a time. My sister and my brothers kept the household going and looked after me. I wrote a story about Christmas Without Mama focused on one particular holiday season when things didn’t go well for our Christmas. In a couple years, Mama married again, to a man I wrote about in my story The Man Who Became My Dad. Life moved along at a hectic pace, with my sister getting married, my brothers going into the military, and me growing up to be a brat! My new step-father (it’s hard to call Dad that) indulged me in just about anything I wanted. He always called me “the baby,” and was wrapped around my little finger. Mama sometimes had to put a stop to his indulging my every whim, and of course, then she became the ogre who didn’t want to see me happy. Poor Mama! Thank goodness this stage doesn’t last forever, because she sure didn’t deserve what she was getting from her spoiled youngest daughter. Mama stood her ground, firm in her convictions but with a loving heart. She never turned against me when I deserved it, and loved me when I didn’t deserve it. If she loved you, she fed you There were meals Mama prepared that were so delicious, that even today all the family still use her recipes. My niece swears by her Chicken and Dumplings recipe, my daughters make her Chess Pie often. Mama’s Oatmeal Cake recipe and Cornbread recipe are absolute staples in our family. I still have some of her handwritten recipes which are very dear to me and my kids. One daughter has enlarged them through with a copier, and framed them for her kitchen wall. To have her handwriting so close makes it seem as though she’s not gone from us, and truly, she isn’t. I’ve provided the recipe module below for the oatmeal cake if you want to try it. 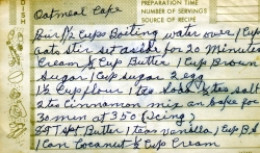 Photo is of my Mom’s handwritten recipe for her oatmeal cake from our family album. My favorite photo of my Mom. This oatmeal cake is a recipe handed down to all of her family by my Mama. It’s frosting is broiled on once the cake is baked. It will handily serve as dessert for a family meal, and is moist and delicious. Once you make it the first time, you’ll find you want that flavor again. Here’s the ingredients and how to put it together. It’s a really good cake for transporting to family potlucks, and even picnics. Pour 1 & 1/2 cups boiling water over 1 cup old-fashioned oatmeal. Stir and set aside for 20 minutes. Meanwhile, cream 1/2 cup softened butter together with 1 cup brown sugar, 1 cup granulated sugar and 2 beaten eggs in a large mixing bowl. In a separate medium size bowl, mix dry ingredients together; 1 & 1/2 cups all-purpose flour, 1 tsp baking soda, 1/2 tsp salt and 2 tsps Cinnamon. Gradually mix dry ingredients into the bowl of wet ingredients, mixing well. Pour into a 9X13 baking dish and bake at 350 degrees for 30 minutes. For the icing, mix together the softened 8-9 Tbsps of butter, 1 tsp vanilla, 1 cup Brown sugar, 1 can or small bag coconut, and 1/2 cup cream. Spread on top of hot cake and put in broiler just long enough to sizzle and lightly brown top of cake. You may also want to add walnuts or pecans to this icing, but Mom did not. The kind of plant, Four O’Clocks, that my mother had planted beside the house. In the yard, she grew something called Four O’clocks that bloomed every late afternoon, succulents called Hens and Chicks, beautiful Petunias, glowing Marigolds, and the hot pepper plants she loved. Inside she grew pots of Coleus in gorgeous variegated colors, Geraniums, Christmas cactus and all shades of African Violets. This was a hobby she loved and she was very good at it. We always said she could poke an old stick in the ground and it would grow. Her blooming in house plants, such as the Christmas Cactus and African Violets bloomed profusely and grew huge. She just had a way with growing things, plants, pets and kids. Photo is from our family album, sorry it’s crooked. Mama gave me my first dog, Peggy, when I was 11-years-old, but she loved that dog as much as I did. She helped me bathe her, made sure she didn’t run out of food in the pantry, and one day I came home from school to discover she had made Peggy a bed on one end of the couch. Knowing Mama’s strict housekeeping standards, I found this remarkable that she would allow a dog on the couch, but when I voiced that, she justified it by saying, “Well, I’ve put a crocheted rag rug and a towel on there, so she isn’t laying directly on the couch.” Mama, you loved that little dog, no denying it! There was nothing that Mama loved better than a “friendly” game of poker or even 500 Rum. But she was somewhat of a card shark….but she did it without cheating, just by keeping track of the cards as they fell, and she was pretty smart at figuring out who was holding which cards. You always had to bring your “A Game” when you played cards with Mama. Another thing, you had to be on your guard, because if you did something that was not exactly right or an error that caused her to lose, she’d let you know it quickly and loudly…that’s why we always laughingly called it a “friendly” game. Mama lived to see 18 grandchildren, 49 great-grandchildren, and seven great-great-grandchildren. After her oldest son’s death in another state, she lost contact with that branch of grandchildren. For years she mourned his death and the loss of his family in her life. When she was in her 80s, the grandchildren contacted her and came to see her. She was overjoyed by this and couldn’t stop looking at them and hugging them. We were so glad they’d found her, since we couldn’t seem to find them. Her grandchildren meant the world to her. The very first grandchild, a girl, started the tradition of calling her “Mommy Esther,” and that was how she became known to all her grandchildren, great-grandchildren and great-great-grandchildren from then on. M is for the million things she gave me… – I sang this many times for my Mom, and one special last time. I was a singer in my youth, and my mother loved to hear me sing this song. The last time I sang it for her was in March of 1995 beside her hospital bed shortly before she passed away. I’m sure it wasn’t my best effort because of the huge lump in my throat, but if it made Mama happy that’s all that mattered. Listen to this song and I’m sure you will understand why tears well in my eyes each time I hear it. What a wonderful story you shared about your Mother. The song was very touching. Hugs! Thank you Cheryl for the kind words. She was my life’s anchor, I felt totally adrift when she died. I miss her every day of my life. Thanks again, for your visit. You a spoiled brat? Oh, yes, I can believe that! Even more, I can believe your mama loved you as much as your love for her shines through here in your every word. And yes, no doubt about it, she loved that Peggy dog of yours too! You’ve convinced me your Mama was a special lady, for sure. And you are a special lady, too, to tell her story. The Four O’ Clocks are greeting card beautiful. I love fence flowers. Nancy, I very much enjoyed reading this. A very interesting life story too! Your mom did a great job raising all of you and of course your step dad as well. I started to listen to the song, then pictured you at your mother’s bedside and new I was going to start crying, so I stopped playing it! 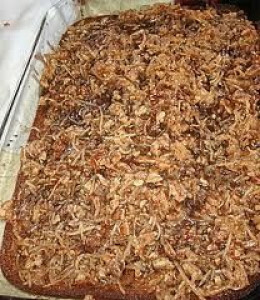 lol – too many tears lately – I pinned the oatmeal cake recipe, I’m going to try it. The icing is very similar to a cake I make from my own grandmother, can’t wait to try this one. Thank you Barbara. I miss her every day of my life, but it’s getting toward her birthday (next month, April) and it always really gets to me at this time. I’m sorry I made you cry, I would not have that for the world, but thank you for the visit and that you enjoyed my Mama’s story. She would have really liked you, because you believe in doing what’s right.